A lovely small tree native to Asia. Attractive all year with showy summer blooms, interesting bark, and brilliant autumn color. Leaves are opposite or alternate or in whorls of 3, simple, 1" to 2 3/4" long, 3/4" to 1 1/2" wide, elliptic, or obovate to oblong. Grown as shrubs or trained as small trees. Many varieties are available from dwarf to standard sizes. Blossom colors are available in white, pink, lavender, or shades of red. Needs regular, deep watering in summer heat. 15' tall x 10' wide. Moderate; once established. Regular deep watering in summer heat. Beautiful blooms in summer with nice autumn color. 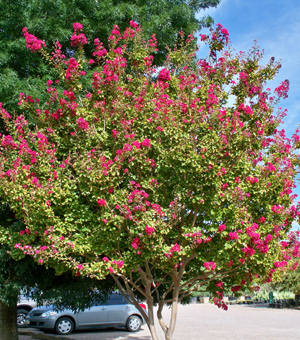 Best as a multi-trunk tree or shrub.